EleFun Games resumes to make us happy with a new version of a well-known story which is worth praising. 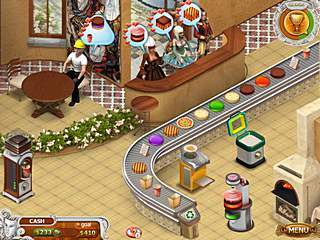 Cake Shop 3 is a time management game where everything is connected with running a cafe, serving customers and earning cash. Unlike the previous episodes, where Emily started her career as a cafe manager and easily built her own cafe on the beach, here you dive into the traveling round the world to get succeed in cafe business in different countries. Moreover you get a chance to test yourself not only as a cafe keeper but also as a designer and a decorator. 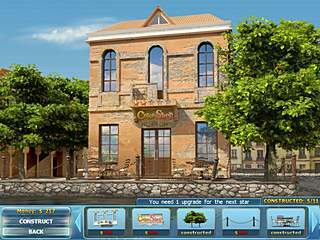 Discover a big variety of new recipes for yourself with Cake Shop 3. Now you are traveling round the world, staying in different countries to manage cafes there. As you haven't tried fruit burrito yet you are headed to Mexico first. There you are met by a mayor who explains that there is only a small cafe in the town and it is a bit run down. So, you are here to back cafe up and to earn money for its renovation. Your first day has stared. All the game through you have tutorials to the action. After completing each level you can see your achievements and the efficiency of your work. The more money you have earned during the time-management levels the more functional upgrades you can purchase. A good thing is that you can buy several constructions at a time. The level of your cafe is measured in stars, that are needed to buy upgrades for your cafe. Only having enough stars you are welcome to purchase new fitting for you cafe like black coffee, ice-cream or strawberry cream machines, pizza oven, square baking cup and so on. All those upgrades attract more customers and let you earn more money and get good tips. The amount of your tips depends on how long you make your customers wait for the orders. It would not be that easy to serve them all in time if you didn't have bonuses. They enable you to freeze the time for 5 or more seconds, replace any order, keep your customers more patient and accelerate your machines. Just choose an appropriate one and get more tips. One more convenience for you to quicken is that you can use the right mouse button and the order will be given to customer according to his or her query. Moving to another country is possible after passing the whole of levels. So, hold your breath to do the same job everywhere you arrive. Great and colorful animation feasts your eyes and amuses you all the game through. Everything is clear and rather easy but it demands your full concentration because from level to level you are to improve you skills and speed up in serving demanding customers. You will have no time just to sit on your hands. 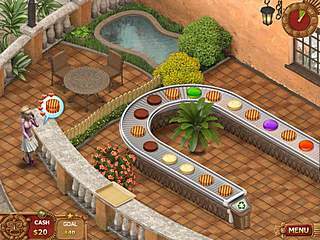 So, if you are a fan of time management games you will definitely have a good time with Cake Shop 3. This is Cake Shop 3 review. Download this game here.